Stock markets keep shaking as trade war panic continues. This is a great example how news can impact the markets even though the real economic fundamentals are strong. Jobs data show 103,000 jobs created in March, unemployment super low of 4.1% and wage growth rose to 2.7%, however, still within a range to prevent higher inflation. This week market review suggests still strong economy profile with corporate profits on a rising path. The news has a significant impact on the stock markets and so also the trade war news. There have been no tariffs imposed yet. What has been happening is a wordplay and political play between the US and China. After the negotiations, there might be no tariffs at all. However, the stock market doesn’t care, stock market reacts and this time it reacts big time compared to what we were used to in 2016 and 2017. A volatility has definitely broken its historically lowest levels and thus, the market will continue to record bigger swings. Sideways trading is very likely to continue in the next weeks and thus, short-term traders should adapt their entry and exit strategies to the current environment. 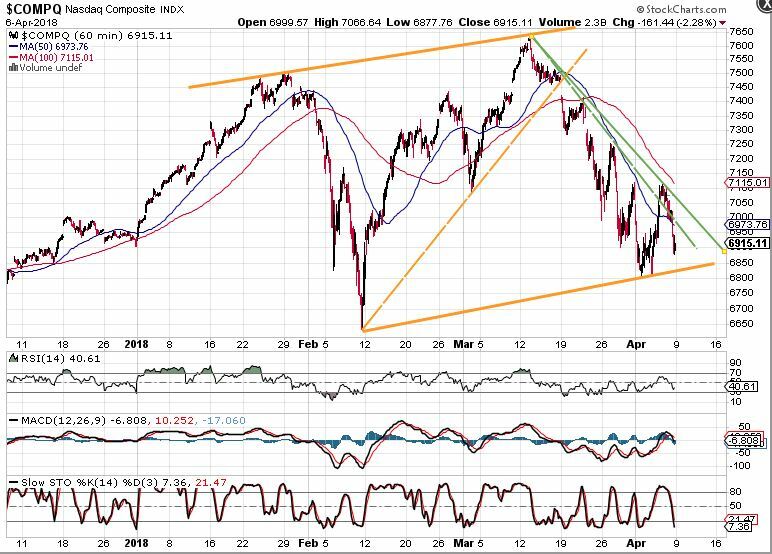 It is perhaps impossible to look for a new trend yet, however, the traders with higher risk appetite might find a below Nasdaq 60-minute setup useful. 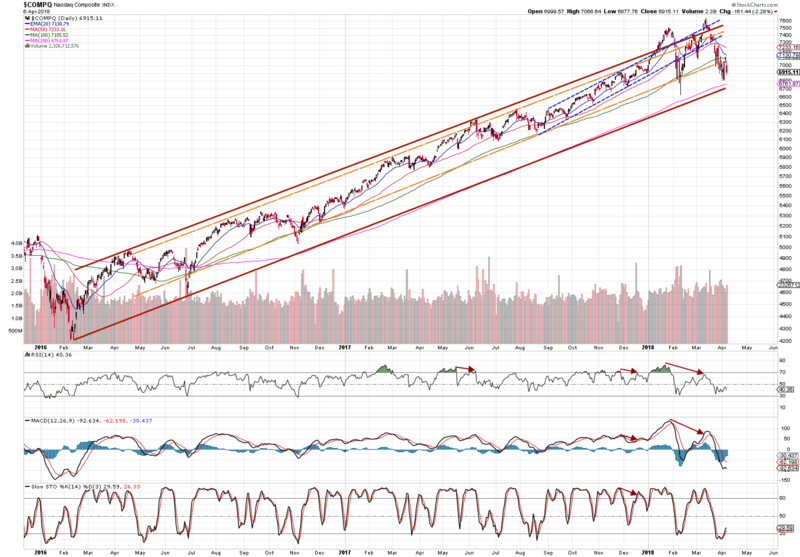 The wide orange lines depict a channel of current correction and both dashed lines show broken trend lines. During the last month price kept hitting 50 SMA on its downward path until last week when it broke up (green dashed line), although it is a good sign of bulls interest, it did not hold and dipped down again. As the new trading week begins, the price is running out of the territory. The unbroken green line is current short-term resistance. A break through the resistance accompanied with 50 SMA through 100 SMA crossover would mean a great entry opportunity. On the other hand, further decline crossing the lower orange line would force the index to look for its long-term resistance – 200 SMA on a daily chart. 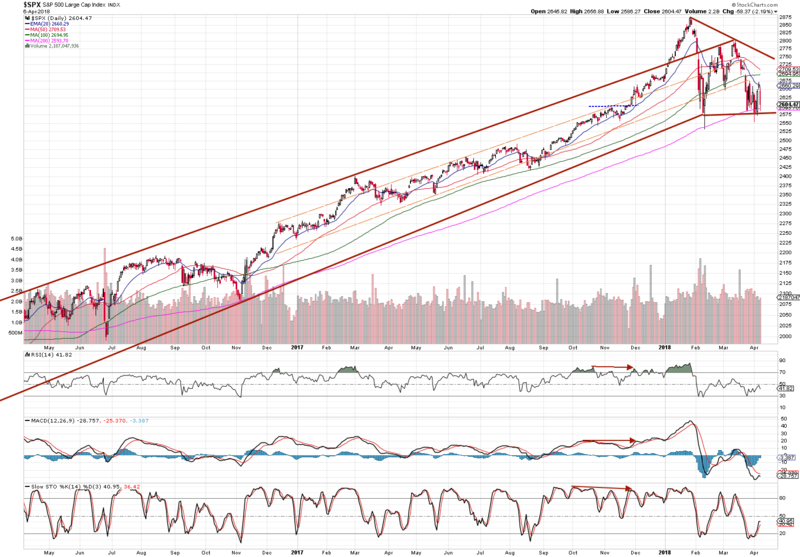 All of the US major indexes are sitting at their long-term support levels. As discussed above, long-term investors should see this a good buying opportunity in healthy stocks. Good quality stocks hold their price levels pretty up and once the markets revolve, they will be those recording the substantial increases. After several weeks of disappointment, the UK’s Financial Times Index has broken through the short-term resistance today. If this trend continues, we are seeing sunny days here. There’s a lot of up-swinging potentials. A current market review suggests an increased volatility, investors’ fear has risen due to negative news and major indexes are still consolidating. However, the fundamentals are still strong and thus, this correction seems to be of healthy nature bringing more buying opportunities. Let’s stay disciplined and focused on big trend!